The tower includes a high speed fiber optic backbone for all condos with a very quick connection for both data and video. For all of the wine lovers there is a private wine cellar with storage. 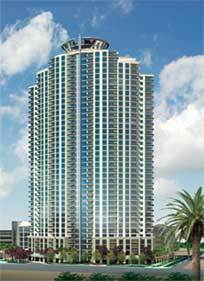 Remaining condos for sale in Las Vegas, start from the mid $500,000s. Allure real estate includes 15 new condo floor plans within 428 units. These floor plans include a studio, one, two, three bedrooms with 671 to 4,400 square feet. Luxury units include two story penthouses and tower suites. The incredible views include surrounding mountains and the Las Vegas Strip. Allure Las Vegas is a project of The Fifield Cos., in a joint venture with ABF Inc., an Andrew Fonfa investment company and CB Richard Ellis-Strategic Partners. The Fifield Cos. Is a developer of high rise condominiums, urban office towers and rental apartments. The Fifield Cos. has created office and living environments in Honolulu, Chicago, San Francisco, Los Angeles, Ft. Lauderdale and Las Vegas. Allure Las Vegas high rise condos will see first residents in October.